When Ravi Kanoria, President of the Federation of Indian Chambers of Commerce and Industry (FICCI) participated in an investors' meet in the United States in September, something was different. The negativity and pessimism about India that characterised such gatherings was missing. "I heard the sentence that India has the ability to rise like a phoenix," says Kanoria. The meeting was on September 24 and 25, shortly after India announced the opening up of multi-brand retail to foreign direct investment (FDI), an increase in diesel prices, and a cap on subsidised LPG cylinders. The announcements came after years of inaction, and sparked a sense of optimism amongst businesses at home and abroad, and a little more confidence that the government may finally be getting serious about reform. But the optimism is tempered with a large dose of caution about whether the momentum will last. 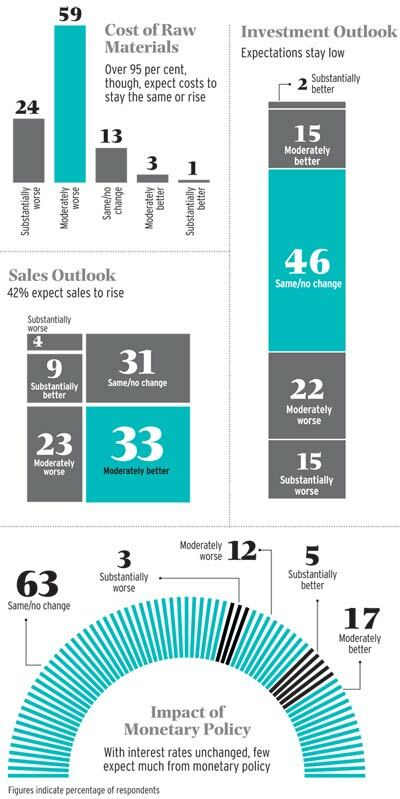 The Business Today-C fore Business Confidence Survey for the July-to-September quarter found that confidence levels amongst businesses have risen after months of despondency. If it were not for the reforms announcements in September - politically fraught ones, at that - business confidence levels would have been worse for the whole of that quarter than for the previous quarter. 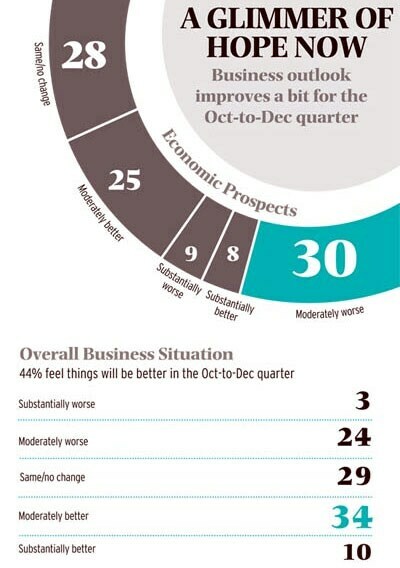 The survey found that businesses were slightly more upbeat about the October-to-December quarter. 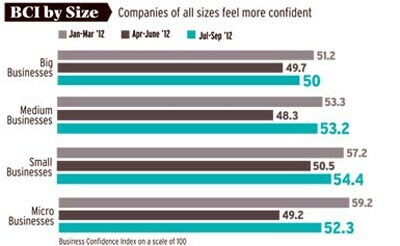 On a scale of 100, confidence levels are up to 52.4, from 49.3 in the April-June quarter. 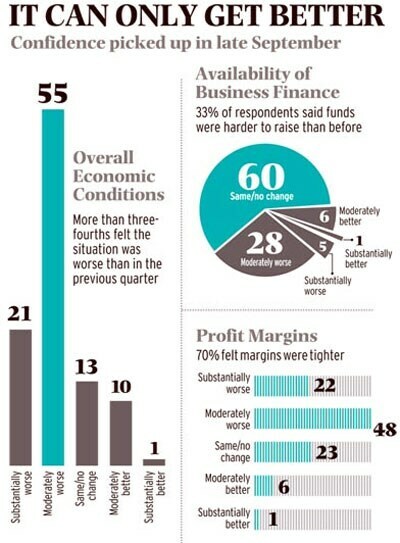 Business Today started the business confidence survey in the first quarter of 2011. From a high of 74.8 in the quarter that ended in March 2011, confidence declined steadily, and picked up only in the first quarter of 2012, ahead of Budget expectations. 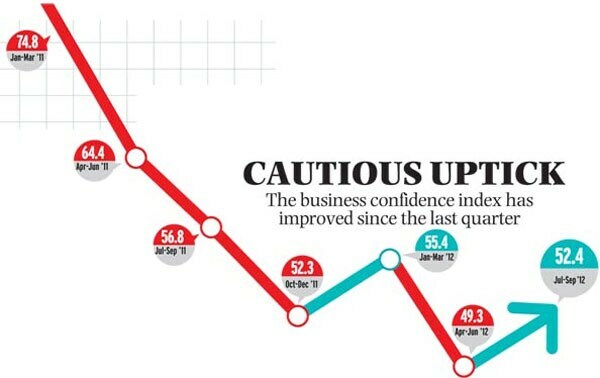 While business confidence seems to be recovering, there is still wariness. Almost all the business leaders Business Today spoke to questioned the government's ability to carry through the reforms. So it could be a while before hope translates into investment. 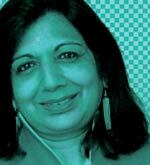 The founder of India's biggest biotechnology company, Biocon, Kiran Mazumdar Shaw, plans to wait and watch before making investment decisions. She says: "The government's moves are positive signals, but investor confidence will be restored only if the government can implement these policies." Glenn Saldanha, Chairman and Managing Director of Glenmark Pharmaceuticals, says: "Although business sentiment is showing signs of positivity, we believe it will take three to six months for the overall business environment to become more predictable and positive." While big businesses are cautiously optimistic, small and medium businesses question FDI in retail, or have yet to form an opinion. For instance, Koathappally Bhavada}san, Managing Director of the Rs 35-crore KP Namboodiri's Ayurvedics, Kerala-based herbal products company, spends a lot of his time battling with excise authorities. His company packages a mixture of herbs and spices for use as an infusion. The excise department taxes it as a 'processed food', but Bhavadasan says it falls in the 'unprocessed herb' category. "They know only a processed item is excisable, yet they are after us, desperate to somehow raise revenues," he says. The prospect of FDI has done nothing to cheer people like him. 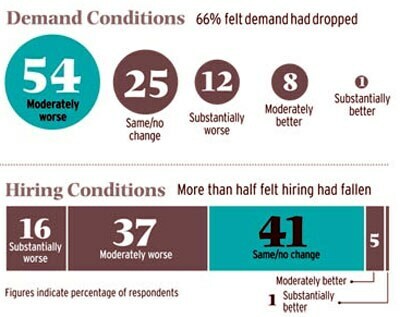 Nearly 32 per cent of the businesses surveyed said they did not expect the recently announced reforms to affect their company's performance, and 47 per cent reported that they expected their businesses to do better. 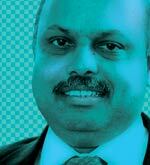 Expectations are mounting on the Reserve Bank of India (RBI) to reduce interest rates. "At the current interest rates, borrowing is not viable for large-scale projects," says M.S. Unnikrishnan, Managing Director at energy and environment engineering company Thermax. "When the internal rate of return of infrastructure projects is in the teens and interest rates are at 13 per cent, it's not viable to make investments." The RBI has raised its policy rate 13 times in the past three years, and cut rates only in April this year. RBI and the government consider six per cent inflation reasonably comfortable, but the recent diesel price hike is likely to exacerbate inflation. The inflation rate rose to 7.55 per cent in August from 6.87 per cent in July. 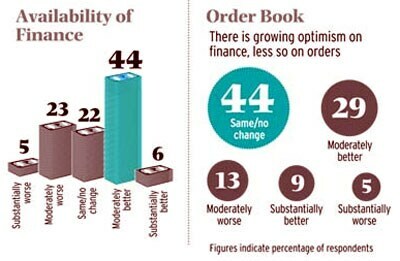 Nearly 63 per cent of survey respondents said they did not expect RBI policy to have any effect on their company's performance in the October-to-December quarter. Interestingly, 46 per cent also saw no change in their investment plans for the next quarter. While the government's ability to take tough decisions in the face of dire political consequences has gone down well with industry, there is scepticism too. Thermax's Unnikrishnan says it will be six months before business sentiment turns positive. Investments in core sectors such as steel and power need to be kick-started, he adds. The Asian Development Bank seemed to echo the caution and scepticism of businesses when it cut 2012/2013 growth projections for India from seven per cent to 5.6 per cent soon after the first set of reforms was announced in late September. ADB said in a statement: "The slowdown in new infrastructure projects and the shelving of some approved projects points to continued weakness in investment." So although the government has made some headway, the task of restoring confidence and attracting investment has barely begun. While apprehensions persist, many reckon that the worst may be over. Harsh Pati Singhania, Managing Director, JK Paper, says the reform announcements are "not enough to convince industry to start investing again. But this would certainly make industry look at investment." Market research agency C fore conducted the survey for the July-to-September quarter. The field work was done in September. A structured questionnaire was administered to CEOs/CFOS of companies. 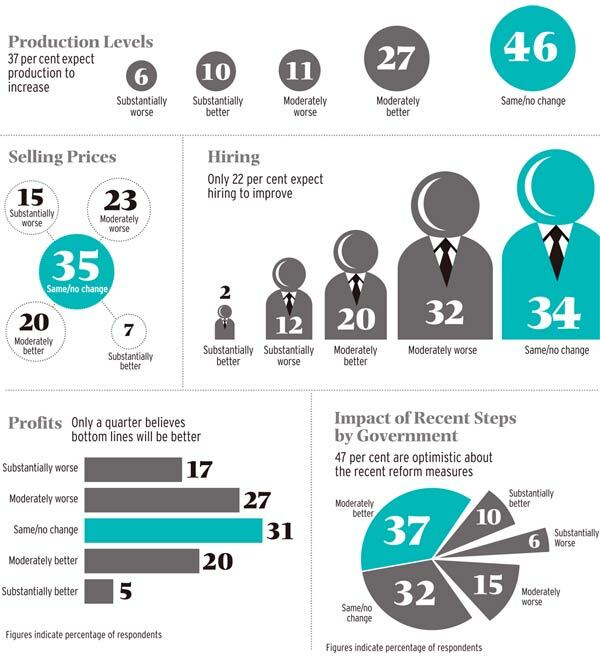 Five hundred CEOs/CFOS representing various industries in terms of sector and size were interviewed. The survey was conducted in 12 cities - Bangalore, Bhubaneswar, Chandigarh, Chennai, Delhi, Hyderabad, Kochi, Kolkata, Lucknow, Mumbai, Nagpur and Visakhapatnam. The companies were segmented based on turnover as well as products. Those with a turnover of over Rs 500 crore are termed as big, those with a turnover of Rs 100-500 crore as medium, those with a turnover of up to Rs 100 crore as small, and those with a turnover below Rs 5 crore as micro businesses. Can Chidambaram turn around the economy?